Bhopal : India News hosted, ‘Manch Madhya Pradesh – Ab Ki Baar Likh Kar Do Sarkar’, a political conclave to gauge the mood of the people of Madhya Pradesh on the forthcoming general elections. The conclave was graced by Shri Kamal Nath, Hon’ble Chief Minister of Madhya Pradesh along with the state cabinet ministers. The conclave was also attended by Shri Shivraj Singh Chouhan,Former Chief Minister of Madhya Pradesh. In another session, Shri Mukesh Nayak, Senior Congress leader, shared his views on how BJP government has misguided the state government for 15 years and how people of the state changed the mandate in favor of congress government. There was an debate between Shri PC Sharma, Minister of Legal affairs and Dr. Narottam Mishra, Senior BJP leader, the two leaders discussed on various administrative issues of the state, while speaking during the session, Shri Sharma said “Erstwhile BJP govt. left no funds”, while BJP leader Shri Narottam Mishra scraps allegations. 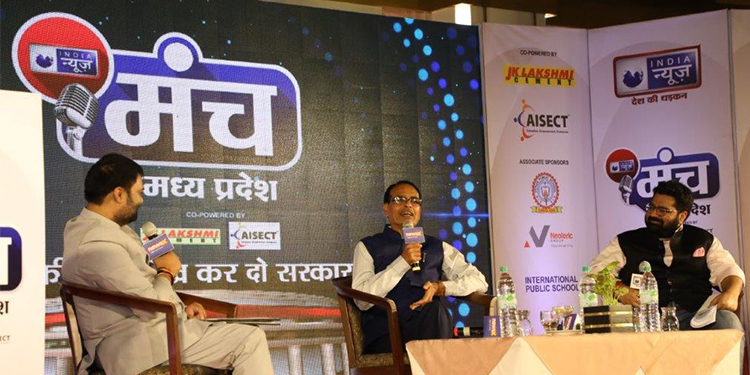 ‘Manch Madhya Pradesh– Ab Ki Baar Likh Kar Do Sarkar’ was marked by multiple panel discussions and one-on-ones discussions that sought and addressed several key issues of the state including development and infrastructure, health and education, youth welfare, law and order, employment and agriculture and development. The conclave was held in Bhopal at Hotel Jehan Numa Palace, which was attended by various political dignitaries and members of civil societies.